Multiple Intelligences can provide the basis for an activitycentred approach that fosters children’s thought. In this session, diff erent types of activities for the teaching of Phonics and CLIL will be presented and implications for the development of creative thinking and smart minds will be discussed. 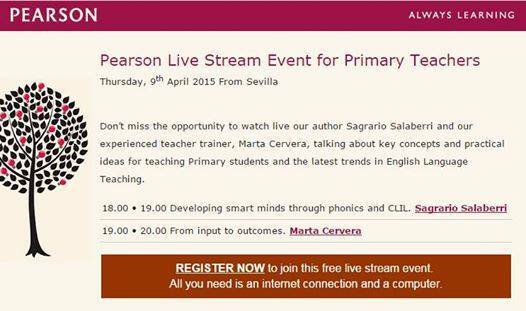 M.ª Sagrario Salaberri is a lecturer at the University of Almería (Spain) and teacher trainer. She was awarded her PhD in TEFL in 1997. Throughout her career, she has been active in fostering teacher training and the teaching of English as a foreign language. She has written many articles and books in that fi eld and has been involved in the development of curriculum design and curricular material for EFL. She has worked as Primary School teacher and inspector. Author of “Classroom language”, “Our Discovery Island” and “Islands”, co-author of “Story telling”, “English Club”, “Teamwork Starter” and “Cosmos-Universe”, and course consultant of “Big Red Bus”. She is currently vice-rector for International Relations and Development Cooperation. Neuroscience has proved that there’s no learning without emotions, and emotions come from our inner motivation, from what it moves us, from the outcomes we intend to achieve. Marta Cervera is an English teacher, certifi ed educational consultant and certifi ed trainer. She currently works as a Teacher Trainer for Pearson. She has been involved in education since 1991. She has taught English to young learners for more than 15 years and soon she discovered and fell in love with educational technology. When she’s not in front of a computer or talking about education, you can fi nd her practising sports and enjoying outdoor activities. Register now to join this free live stream event! This entry was posted in Pearson, Workshops and tagged event, Pearson, streaming by Manuel Caro. Bookmark the permalink.